Q: What invention in 1964 made the telephone accessible to people who have hearing loss or are unable to speak? 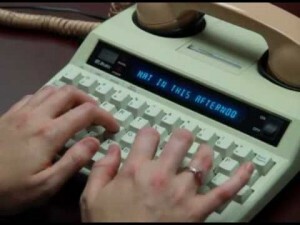 Robert Weitbrecht, a deaf scientist, developed the teletypewriter (TTY) in 1964. A TTY is a device that lets people who are deaf, hard of hearing, or have speech disabilities use the telephone to communicate by allowing them to type messages back and forth to one another instead of talking and listening. The original machines required a printer at each end to print what was being typed; they now work with a screen display which has made it a more portable device. A TTY is required at both ends of the conversation in order to communicate. Today, use of a Telecommunications Relay Service (TRS) is the more common method for people with hearing loss or speech disabilities to communicate over the phone. TRS uses operators, called communications assistants, to facilitate telephone calls between people with hearing and speech disabilities and other individuals. Click here to learn more about the TTY. Click here to learn more about TRS.